Married Rev. George Butler on 8 January 1852 at St Andrews, Corbridge. Died 30 December 1906 in Wooler. Buried at Kirknewton. For information on the lives of Josephine and her five sisters read "The Six Brides of Dilston" by A.R.C. Bolton. 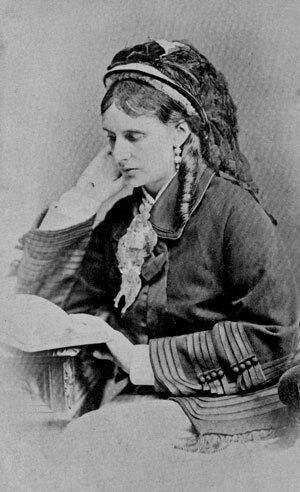 The latest books about her life are by Jane Jordon, published by John Murray in 2001 and Helen Mathers' book: "Patron Saint of Prostitutes: Josephine Butler and a Victorian Scandal" published by The History Press (11 Aug 2014). There are collections of her letters and other records in The Women's Library at the LSE in London , at Woodhorn in Northumberland and at Liverpool The pencil portrait above by George Richmond was made in June 1851. A great deal of information about Josephine is available online. The book she wrote about her father can also be read online here. Her "Personal Reminiscences of a Great Crusade" can be read online here. 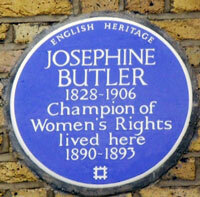 A book called "Josephine E Butler, An Autobiographical Memoir" can be read online here. 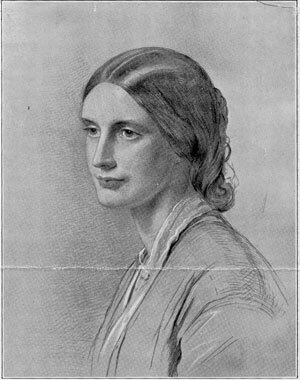 Papers related to Josephine Butler are held in the following repositories: Northumberland Record Office (ref: NRO.229) - correspondence and diaries (1851-1905); Liverpool University : Special Collections and Archives - correspondence and papers (c1853-1906) includes a further 155 letters, and other material from Josephine Butler Memorial House; Oxford University: Balliol College Library - papers related to Benjamin Jowett and correspondence; Royal Institute of British Architects Library (ref: BuFam/1/4, 2/4, 3/2, 4/2) - letters to Edith Rhoda and Arthur Stanley Butler etc (c1882-1906); further family correspondence is held at St Andrews University Library; letters (c.1860-65) to Hannah and Emily Ford etc. are in Leeds University, Brotherton Library. Two of her letters can be read here. 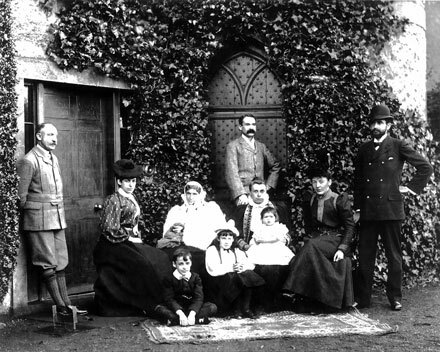 Above: The Butler family at Ewart in about 1897. Josephine's son George married Mia St Paul who was an orphaned heiress and had inherited Ewart Park. From the left: Arthur Stanley Butler, Edith Rhoda Bolton, Josephine E. Grey Butler, Maria St. Paul, George Grey Butler, Margaret Talbot Butler, Charles Augustine Vaughan Butler. 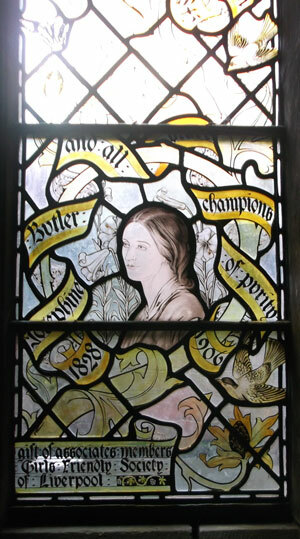 The children are: Arthur Butler and Edith Josephine Butler and the baby is Hetha St. Paul Butler. (Photo courtesy of Mary Margaret Butler Wray). Another photograph taken at the same time can be seen here. 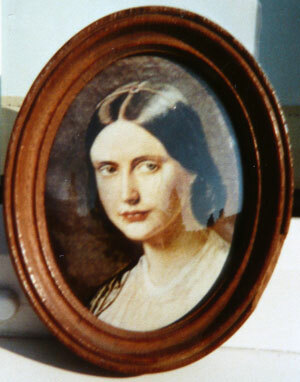 Left: Copy of a portrait of Josephine by Julius Jacob painted in 1853. Irene Butler died in 1944. Stained glass window in Liverpool Cathedral, based on the George Richmond portrait. Photo by Bob Evers. 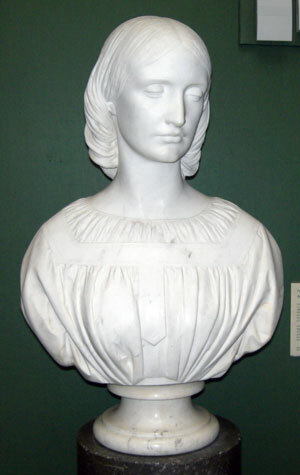 Bust of Josephine in Walker Art Gallery Liverpool. Photo by Bob Evers. The National Portrait Gallery in London has a painting of her by George Frederic Watts. 1895. See here. Above: Blue plaque on the house in Wimbledon where Josephine lived with her son George and his wife Mia. 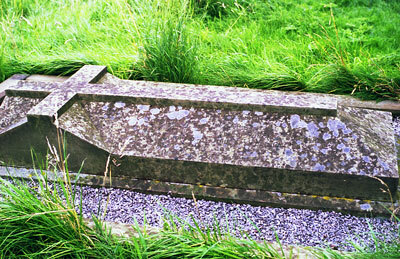 Below: Josephine's grave at Kirknewton. Photo by Claire Grey. Death of Miss I. M. Butler, Late of Ewart. It is with great regret that we have to record the death of Miss Irene Maria Butler of Synderford, Thorncombe, which took place in a London nursing home, after a year of suffering most patiently and courageously borne. Miss Butler was the second daughter of the late George C. Butler of Ewart Park, Wooler, and Maria, Countess St. Paul; and had only been a resident of Thorncombe for little over a year. Before going to Synderford Miss Butler had been Private secretary to Viscount Cecil of Chelwood from the time that, as Chancellor of the Duchy of Lancaster, 15 years ago, he was a Cabinet Minister. It was solely on account of her ill-health that she was forced to give up her work. When Nazi Germany began its policy of racial discrimination it was to that great humanitarian, Lord Cecil, that the oppressed people of Europe turned for help; and, in consequence, Miss Butler found herself responsible for the rescue of considerable numbers of refugees from Nazi persecution. She left herself personally responsible for each one of those unfortunates, and her great sense of justice, her sympathy for the underdog, and her championship of the oppressed men, women and children led her to work far into the night on their behalf after a normal office hours were over. She had an uphill struggle, but she succeeded in her work of mercy where others had failed. To her refugee work she gave of her best; those qualities of patience, perseverance, tact, intelligence and kindly understanding which endeared her to so many. It would be impossible to estimate how many lives she saved and how many hearts she gladdened with fresh hope and encouragement. Miss Butler was one of the first Air Raid Wardens for the Borough of Chelsea and, in spite of her arduous secretarial work, she was never absent from her post of duty during the concentrated air raids on London in 1940-41. In all the heavy bombing raids she displayed courage, enterprise, cheerfulness and coolness beyond all praise, in those dark days. Refugees’ friend Miss Irene Butler, who died recently in a London nursing home, was the second daughter of the late George Grey Butler, of Ewart Park, near Wooler, Northumberland, and the grand-daughter of Josephine Butler, the social reformer. Miss Butler was private secretary to Viscount Cecil of Chelwood for 15 years. When Germany began its policy of racial discrimination many of the oppressed people of Europe turned to Lord Cecil for help and Miss Butler assisted in saving numbers of refugees from being sent to concentration camps. Her sense of justice and her indignant championship of the under-dog gave to her the sensation of being personally responsible for each one of these unfortunate people and she worked far into the night on their behalf. "Many good-hearted English people made no headway against the restrictions imposed upon admissions to this country. Success was only possible by the exercise of patience, perseverance, tact and intelligence. To her refugee work Miss Butler gave, with Lord Cecil’s authority, those qualities in full measure and it would be impossible (writes a correspondent) to estimate the number of lives she saved and how many hearts she gladdened with encouragement and fresh hope. Northumbrians who have read John Strachey’s "Post D" will be interested in the fact that Miss Butler figures therein as Miss Dalrymple, and a fellow woman warden, also in the book, in an appreciation, writes; "Irene Butler was among the first wardens to join up in Chelsea. "She chose to be part of the garrison of London and that choice certainly helped to kill her. It was a choice that she made as the citizen of a free country, a civilised person sacrificing comfort for the sake of civilisation." MARIA BUTLER (nee ST. PAUL), a Countess of the Holy Roman Empire, only child and sole heir of the late Sir Horace St. Paul, Bart., Count of the Holy Roman Empire, formerly M.P. for East Worcestershire, by his wife Jane, dau. of George Annett Grey, Esq., J.P. and D.L. of Milfield, Northumberland. Armorial bearings (of St. Paul) are as follows, upon a lozenge- Quarterly 1. and 6, argent an eagle displayed sable; 2 and 5 divided in tierce into three compartments, i. azure, three lions rampant or, ii. azure a lion rampant argent, iii. gules, on a cross argent, nine bullets sable; 3 and 4. per pale or and sable, a bend engrailed countercharged, and over all, on an inescutchian argent, a lion rampant, double queued gules, ducally crowned or. Supporters -On either side a lion regardent argent, langued gules, each supporting between the paws a tilting –spear or; from the dexter, a flag or, charged with an eagle displayed sable; from the sinister, a flag argent, with fringe or, thereon a lion rampant, double-queued gules and ducally crowned gold. Married, Jan. 19 1893, George Grey Butler Esq., M. A. Trin. Coll., Bamb. J.P. co. Northumberland (son of late Canon George Butler, D.D.) and has Issue -Horace George St. Paul Butler; and Hetha Grey St. Paul. Seat- Ewart Park, Wooler, Northumberland. 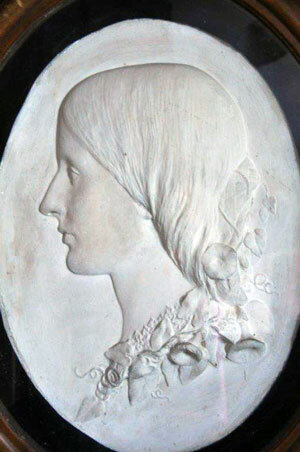 Plaster relief of Josephine by the artist Alexander Monro (1825-1871) About 1855? There is a copy in the Walker Art Gallery. Photo by Ivar Grey 2016.